Lots of my readers know I am in a Toastmasters International Club here in Eugene. I go to their weekly meetings to improve my public speaking and communication skills, and in the 3.5 years in this organization, I have went from wallflower to being in command of the lectern. If you have ever freaked out at the thought of speaking before an audience, then you are like the majority of the public that gets queasy at the thought of a room full of people hanging on your every word. As I work through the TM program, there are numerous manuals each with five speeches in them, with each speech designed to teach the speaker a new skill. We are encouraged to craft these speeches about things we know, and of course, if its Av8rdan, it must be airplanes. My club member friends have patiently sat through well over 10 speeches I have given that had some sort of aviation topic. They sat artificially mesmerized when watching the speech I made that taught "communicating on television"...in which I videotaped myself explaining the many details of performing a pre-flight inspection on a Cessna 172. From the looks on their bored faces, I think I lost them at "open the door, turn ON the Master Switch blah blah blah." Yes, I have given speeches on non-aviation topics, but they are few and far between. In TM, it is not the topic that matters, it is the delivery of that topic. So if I want to ramble on about the TSA LASP program, or Jerrie Mock and her famous Cessna 180, or how IFR training is really REALLY hard, my fellow TM'ers sit there and take it like troopers. Tonight, we had a quite unique meeting, in which two members both gave speeches that were cooking demonstrations. As the meeting was wrapping up, Janice – who is a 10-year TM member, soon-to-be published author and part-time stand-up comic – called me to the lectern. She had me tell the club about my rating, and I welcomed the applause. After the roar of the crowd subsided and she presented me with a crazy card and a couple of very cool gifts, she said "oh, and we have one more thing for you." What followed was a coordinated display of paper airplane aerobatics as all 15 or so members pulled out at least two paper airplanes each and hurled them towards me! 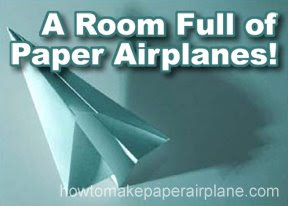 Of course, being paper airplanes, none of them went where they were intended to go, because as we all know, paper airplanes have minds of their own. To see the meeting room fill with the color and spectacle of 20-30 paper airplanes going every which way in my honor was one of the coolest things to happen to me in some time. These folks are my friends, and damned near my family too. I've seen many of them each Tuesday for over three years, and I am blessed to be a part of their club. Papyrus Flying Machines and Their Erratic Navigational Guidance Systems. Heck yes, bet your farm I can make up 5 - 7 minutes of spiel on that. ATC Survey Results It's a Lovefest! Just What is All This IFR Stuff Anyway?